[Inspiration] 13 Travel Essentials to Ho Chi Minh Trip in March 2017? A trip to Ho Chi Minh, Vietnam, again? Yes! I will travel to Ho Chi Minh, Vietnam again with my family. I'm excited to fight again with my mom. It's the first time my mom went to travel after my dad was pass-away on early September 2016 ago. I hope this trip will help my mom feeling happiness like before. Our mission is still same with our last trip, which is shopping. The different on these times is out of my 3 family members not yet travel to Ho Chi Minh, Vietnam and this is their first time. So I will be their tour leader and also tour guide along this trip. This trip is 4 days and 3 nights around Ho Chi Minh, Vietnam. The weather at Ho Chi Minh is same like Malaysia so I don't need to pack any extra jacket. I just need comfort clothes for hot weather at Ho Chi Minh. But I still need to be stylish even its trip to Ho Chi Minh, Vietnam. It's because I still have some of the projects that I need to be done. 1. Acer Notebook with Typo Notebook Case: since this year I'm busy with blogging task so I need to bring the Acer Notebook together with me. So I can so my work even I'm in holiday moods. It's okay. 2. Passport with Bonia Passport Cover: most important things I should have to bring together when I traveling aboard, which is my passport. I like to cover my passport with Bonia Passport Cover. This Bonia Passport Cover is the gift from my mom on 2013 ago as birthday present and it's still in good condition. 3. Purse: I like to bring small purse when I traveling and I don't need to bring many cards since I traveling aboard. I just bring my ID card, Insurance Card, credit card (just when I have emergency situation only) and money (Vietnam Dong and Malaysia Ringgit). 4. iPhone 6: I never left behind my phone on every day. How come I can miss this? 5. iPod and Earphone: the most recently I always update the latest songs in my iPod so I will bring my iPod to kill my boring. 6. Blog Postcards and Business cards: this year I make my blog postcard as souvenirs to my friends during my trip to holidays. I will post this postcard to them since I want to make it special and surprises. 7. Mirrorless Cameras: I never can forget to bring my cameras. During this trip, I will bring two mirrorless cameras, which are Samsung NX mini (for video recording) and Fujifilm X-T10 (for photos). 8. K-Beauty: it's just for finish touch-up like MoonShot foundation cushion, lipstick, lip gloss, and hair brush since the journey by flight just take around 2 hours 30 minutes only from KLIA. 9. BigBang MADE Bag Pack: I bought this bag pack during their concert in Seoul on last 2 years ago and I like this bag so much. It's because of light and also big space too so I can put all my hand caring things in this bag only. 10. Mixxo Jacket: the reason I wear a jacket because I know the temperature on the plane will be low into the skies so I need to maintain my body temperature and also feel warm too. That why I need to wear jacket on the plane even I know the whether at Ho Chi Minh so hot like in Malaysia. 11. Daniel Wellington Watch: I like this watch so I will bring it together with me. 12. Notes Books and Pens: I need this for me to writes all the ideas for my blogging task. 13. Power Bank: I always carry power bank to charger my iPhone when I running out of battery. 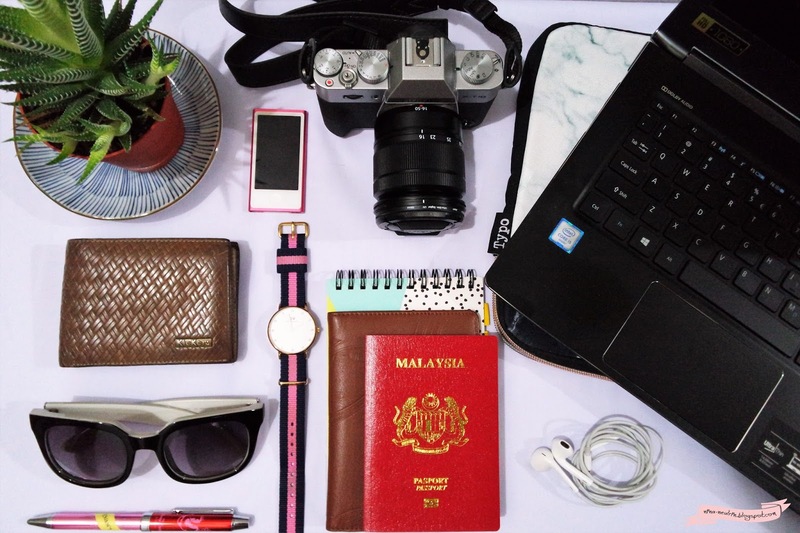 That's all the things I will bring along during my holiday on this March with my family. Maybe the traveling can heal my mom and me feeling a little bit as I wish. [Lifestyle] Why Do I Love Seoul?